Heat oven to 325°F. In 5-quart Dutch oven or 13x9-inch (3-quart) glass baking dish, toss beef with flour. Add frozen vegetables. In large bowl, mix remaining ingredients. Pour over beef and vegetables; gently stir until mixed. Cover; bake 3 hours 30 minutes to 4 hours or until beef is tender. Remove bay leaves before serving. 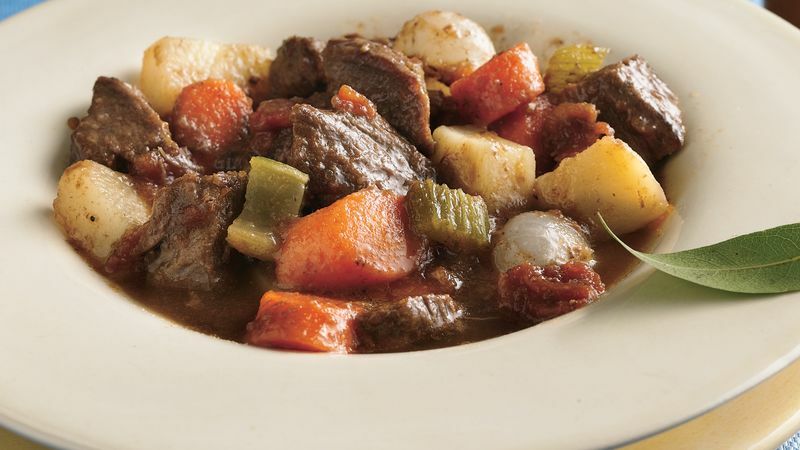 If you'd like to reduce the fat in this recipe, use sirloin steak cubes instead of stew meat.